The conversations around Big Data are endless—and for good reason. Essentially, Big Data provides a company with more information on all levels including its clients, industry trends, audience engagement patterns, business challenges, buyer personas, and much more. Add to that its benefits—such as improved supply chain management (SCM), increased multi-tier visibility, greater business efficiency, and relationship management—and one could question how a company can ever go without Big Data. 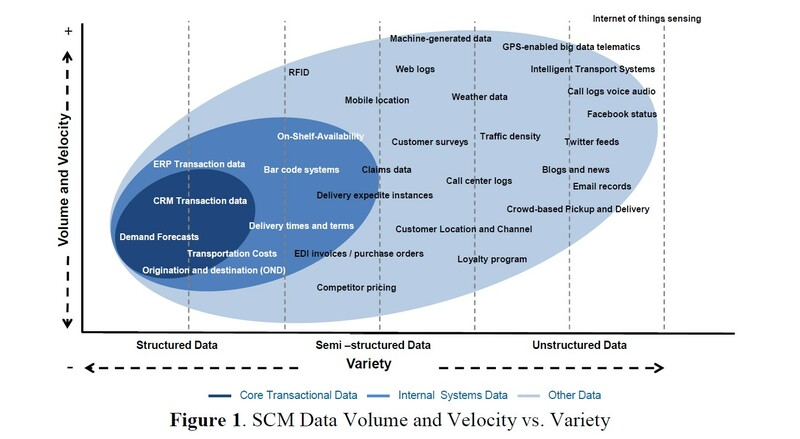 In fact, a vast majority of business executives (97 percent) understand how Big Data can benefit their supply chains.1 While its usage is also already evident in numerous industries, some companies remain challenged with Big Data investment cost, security and privacy issues, and data needs that require careful consideration of Big Data’s application before complete implementation. To better help you understand how Big Data can fit your plan for business growth, here we outline five reasons why you can no longer overlook the Big Data for supply chain discussion. 1. Big Data growth shows no signs of slowing down. 2. More industries, including healthcare, automotive, and high-tech, recognize the need for Big Data. For example, 95 percent of healthcare CEOs said they were exploring better ways to harness and manage big data, according to PwC’s Annual Global CEO survey.6 While only 25 percent of healthcare companies made innovative changes and 36 percent have made some progress in regards to Big Data, a large majority of healthcare CEOs agree that technology will change the way healthcare service is delivered. Other industries which witnessed their share of data impacts include both the automotive and high-tech space. Thanks to plug-in hybrid vehicles—some which generate 25TB of data in one hour7— MapQuest, Google Maps, and global positioning system (GPS) providers such as Tom Tom and Garmin, the automotive space is better positioned to further adopt Big Data than perhaps companies with no record of data analysis or measurement. In addition, Big Data’s evolution, in relation to self-driving cars, responsible sourcing, or automotive parts manufacturing, can play a big impact on automotive supply chain processes. In the high tech space, providers of service, software, and hardware continue to monetize on data insights to set themselves apart from their competition. In addition, the use of data can more often than not enable companies to better collect information about minerals they should not be using in high-tech products. For example, a single, centralized data repository and a single, consistent, and repeatable data collection process can enable companies to better report on conflict minerals. Reporting on where minerals used in company products came from is already a requirement under the 2010 Dodd-Frank Wall Street Reform and Consumer Protection Act to prevent the use of conflict minerals (i.e. those minerals that originated in the Democratic Republic of the Congo or an adjoining country, according to the Securities and Exchange Commission). By already having that data, companies can prevent high-tech supply chain risk (such as those associated with conflict minerals) by accessing data that allows them to see product, product category, part, and raw material-level data. 3. Companies who want more supply chain collaboration should be open to an ‘unstructured’ approach. 4. Is more legislation around Big Data necessary? 5. Need for increased Information Technology (IT) and data analysis skills. With Big Data growth comes demand for computer generalist or “data scientists.” According to research from Gartner, 4.4 million IT jobs will be created by 2015, however, only one-third of the jobs will be filled.14 As such, businesses may want to consider addressing the rapidly evolving use of Big Data analysis and talent shortage. They may choose to train their current employees with the data analytics skills necessary to effectively manage and analyze Big Data. If possible, they may also consider: 1). onboarding talent with advanced computer programming, IT, or data analysis skills; or 2). using data collection software that also provides built-in analytics and reporting for easy data configuration, to address the role of Big Data in their supply chains. There are many ways businesses implement SCM processes to ensure the effectiveness of their supply chains—and Big Data continues to be a growing part of that process. Want to know if you’re at the point of needing to change your SCM processes to manage Big Data? Learn how Resilinc DataServices can ensure accurate data validation with the right solutions for complete end-to-end supply chain consistency.